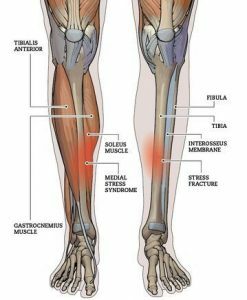 Shin splints is a common term used for medial tibial stress syndrome. 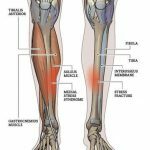 It is an overuse injury of the leg and refers to pain that is experienced anywhere on the on top or inner side of the shin bone (tibia). Shin splints are believed to be caused by the tendons and muscles that run the length of the shinbone which pull on the bone creating inflammation. Shin Splints can affect both adults and children and can occur with any physical activity. It has been reported to occur more frequently in military recruits, distance runners, dancers, football players and gymnasts.